Opposition leader Nelson Chamisa’s staunchest allies are set to lock horns in the battle to lead the party’s youth assembly at the forthcoming elective congress in May after more than four threw their hats into the ring. 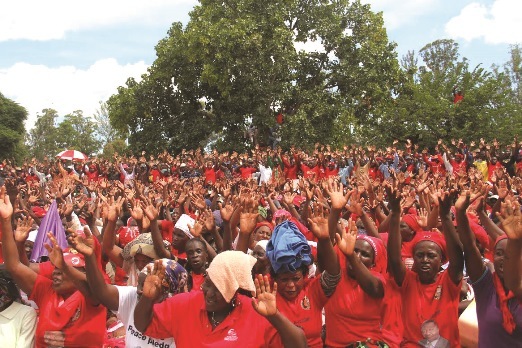 The death of MDC founding president Morgan Tsvangirai in February and the subsequent rise of Chamisa as his successor have seen the party’s youth assembly emerging as power brokers. Despite playing a significant role in Chamisa’s controversial rise which was characterised by allegations of violence meted out against former MDC vice president Thokozani Khupe — the youth assembly once again proved its growing influence by ensuring that its members win during last year’s primary elections. Those who have shown interest in the position of youth assembly chairperson include secretary-general Lovemore Chinoputsa, MP for Tafara-Mabvuku James Chidhakwa who is a member of the assembly’s national executive, Obey Sithole and Dennis Juru; all aligned to the Chamisa camp in the MDC factional matrix heading into the congress. “We hope to give vibrancy to the organisation both locally…its ideological identity as a social democratic party, inculcating thought leadership in engaging with Africa and the world,” Siziba said. With Chamisa’s position likely to be challenged by one of his deputies Elias Mudzuri and secretary-general Douglas Mwonzora. “Almost all the guys in the youth assembly belong to Chamisa’s camp and one wonders why they don’t just reach an agreement on one candidate per position so that they can outflank Mwonzora’s camp. “Someone in the camp must show leadership and not allow this anarchy to continue otherwise people will regret come May,” a source close to the camp said on condition of anonymity to avoid falling foul to the law since nominations have not been opened up as yet. Already vital battlegrounds such as Harare, Bulawayo, Mutare and Masvingo have been turned into “war zones” of intense political contestation for positions. Nominations for the do-or-die congress are expected later this month, taking the country’s largest opposition party into a crucial phase which means different things to various constituencies making up the party. For Chamisa’s supporters, the upcoming elective congress is more of a referendum on the charismatic 41-year-old politician who has had a tumultuous 13 months in office. Ever since, Chamisa has struggled to shrug off accusations that he used his then assumed closeness to Tsvangirai’s widow, Elizabeth, to torpedo the ambitions of the likes of Elias Mudzuri and Thokozani Khupe who were also eyeing the post.